Those of you in the ‘know’ will appreciate that the working day excludes weekends and bank holidays. 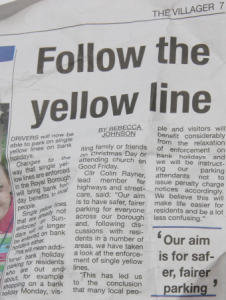 Single yellow lines do not apply outside the working day. Also interpretation of National laws is out of the jurisdiction of local Councils. Anyone fined for parking on a single line during the weekend could consider a refund. Perhaps a reader would email the truth about the proposed local relaxation of the regulations. This pair is found near Shute End, Wokingham. Not a BOGOF offer but a mistake. The perpetrators of this faux pas are currently lined up facing the Naughty Wall.